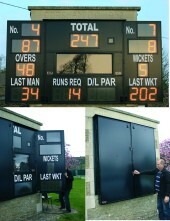 ESU were able to provide Corsham CC with a cost effective innovative solution when they came to refurbish and upgrade their scoreboard. The designs ESU provided had to take into account that the club is situated in a planning conservation area and the associated constraints. After discussions with the club the final design was agreed. This comprised of a central panel with scorers window and two hinged side panels which form a shutter when not in use. The units were constructed in our factory and taken to site where the old scoreboard was removed and a new framework fitted to the aperture onto which the units were fixed.